A few weeks after its initial reveal, LG has launched an official site for the upcoming G Watch, its first smartwatch powered by Google’s new Android Wear platform. It contains a smattering of new details about the wrist-worn device. For one, it’ll be available in two color variants called ‘Champagne Gold’ and ‘Stealth Black’. While the latter uses only a single color, the former swaps in a white wristband and a subtle gold trim around the edge of its rectangular display. Secondly, the G Watch will be water and dust resistant. LG says you’ll be able to wear it for outdoor activities and “rough conditions”, which suggests durability is one of the manufacturer’s top priorities. The company is also touting an always-on display that “never sleeps” While some smartwatches require a gesture or input to activate, it seems the G Watch will remain active. Useful if you need to quickly glance at the time, but possibly distracting if you’re at the movies or attending a rather important meeting. 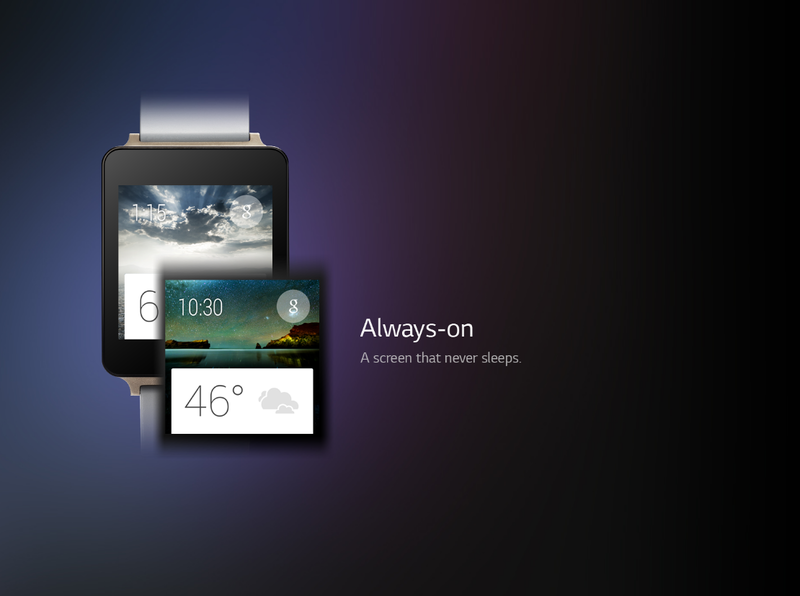 The G Watch runs on Android Wear, a new platform designed by Google for wearables. Announced last month, the first software iteration is targeting smartwatches and centers on glanceable notifications.